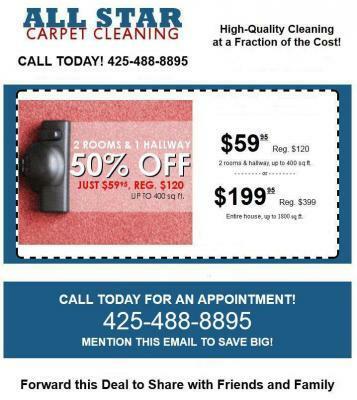 Carpet Cleaning service in Bothell, Wa. Homeowners have at one time spilled something or had spots on the carpet too long and it looked hideous. As much as it is recommended that one cleans the carpet at least once a year, a carpet is one household item that if care is not taken can be downright unhealthy, toxic even. While some people insist on cleaning their own carpet, it is not encouraged owing to the fact that the carpets are made from different materials and only a professional would know which cleaning method is appropriate for each material. Also, buying the carpet cleaning machines could be quite expensive not to mention that the whole cleaning process may be too much work for you and you may not even achieve the level of cleanliness required.That is why we recommend you call the qualified and competent All Star carpet cleaning services. We are a carpet cleaning service in Bothell, WA. That works with a truck mount carpet cleaning machine meaning that as soon as you call us, we will be at your doorstep at the time of the appointment. Moreover, we are conveniently located to be able to serve you better. We are the quality carpet cleaners offering value for your money. Our services are fast, thorough and reliable and with our top notch equipment we strive to remove even the stubbornness of stains leaving your home clean, fresh and rejuvenated.CARPET CLEANING SERVICE in Bothell, WA.